Despite the era of nostalgia, the movie itself is set in the near future, after events have resulted in many locations becoming slums. To escape, almost everyone takes part in a massively multiplayer virtual reality environment called OASIS, co-created by James Halliday (Mark Rylance) and Ogden Morrow (Simon Pegg). Many take the game VERY seriously – losing in the game results in losing their in-game characters, called being “zeroed out” and leads to suicides in some cases. People spend a lot of real money to enhance their in-game experience, such as full-body feedback outfits, 360-degree treadmills, etc. When Halliday passes away (Morrow left the company), he wills control of OASIS to be given to the one who finds an in-game Easter Egg, which can only be obtained by completing three different game quests to obtain one of three different keys. Wade Watts (Tye Sheridan, X-Men: Apocalypse), a 17-year-old orphan living with his aunt in the “Stacks”, shoddily-built vertical trailer parks, known in OASIS as Parzival, teams up with his on-line friend Aech (Lena Waithe, Master of None) to take on the first quest, a race through a city with many obstacles, to find the key before other “gunters” – easter egg hunters – find it first, including an army of players from the Innovative Online Industries (IOI), a corporation who wants to take over the OASIS and use it to sell marketing to the players, and will stop at nothing to do so. He also befriends Art3mis (Olivia Cooke, Me and Earl and the Dying Girl), a famous gunter, along with Sho (Philip Zhao) and Daito (Win Morisaki), to form the “High Five” and team up in the quests. Also appearing (at least in voice) are T.J. Miller (Deadpool), who’s voice provides a nice counter to the apparent rugged bounty hunter person of i-R0k; Ben Mendelsohn (Animal Kingdom) as Nolan Sorrento, the CEO of IOI; and Hannah John-Kamen (Killjoys, Ant-Man and the Wasp) as F’Nale Zandor, a real-world IOI operative hunting down the High Five. While the plot is somewhat basic and predictable, it’s the visuals and references that are really interesting. I at first thought that this was going to be too CGI-centric and a distraction, but after a bit it felt natural in a weird way. And there are some stunning recreations, like the parts from The Shining). But what really hooked me was all the little things, both overt and background, that referenced the things we grew up with. From the many characters that can be seen in the background to the appearance of the Iron Giant (although, as some point out, misused), to the various Atari games and more. There are so many it will take multiple viewings to spot many of them – finding easter eggs in a movie about finding easter eggs!!! I saw a Colecovision towards the end…and I want Halliday’s t-shirts! If you are particularly interested in motion-capture acting as well, check out the special features to see how a lot of it was done – there is just as much live acting, if not more! Overall, it was a very enjoyable movie with some laugh-out-loud moments and plenty of “did-you-see-that”s as well! 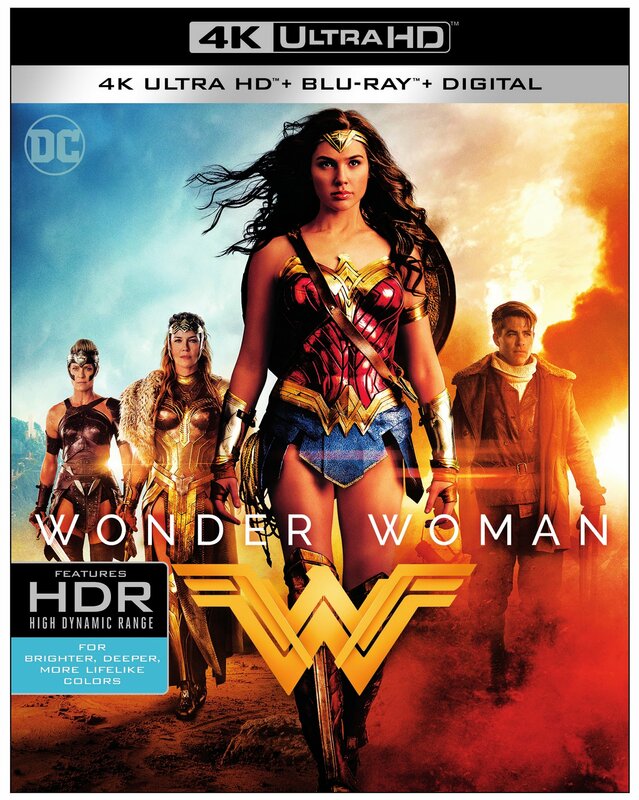 The summer blockbuster hit for DC and Warner Bros. starring Gal Gadot arrives before the summer is out…and it will include a bonus scene not shown in theaters! It will be available first on Digital HD on August 29th, followed by the Blu-Ray, Blu-Ray 3D and 4K Ultra HD discs on September 19th. 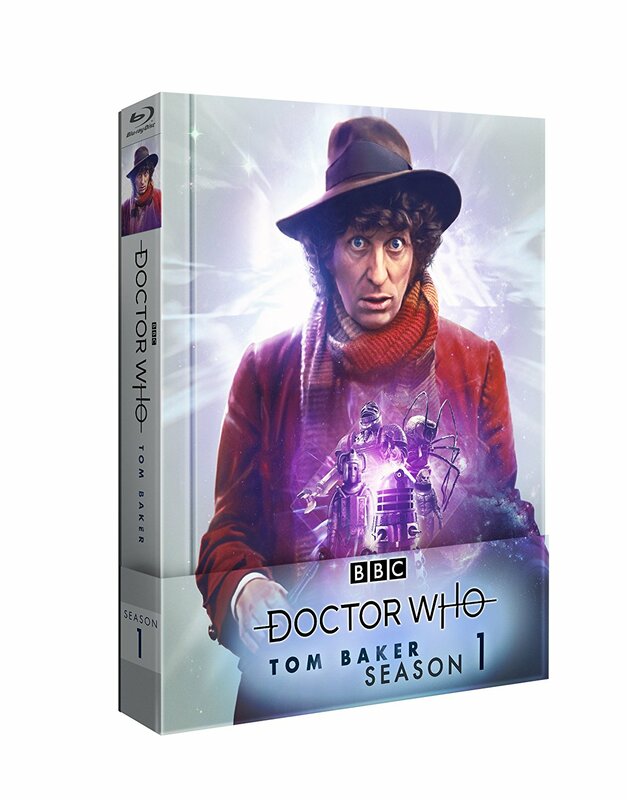 See the trailer again below! 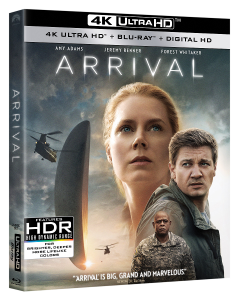 Best Picture nominee Arrival arrives in Blu-ray, 4K Ultra HD Blu-ray and DVD next Tuesday, February 14th! 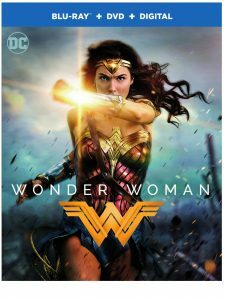 The film was hailed by critics as “mesmerizing” (Peter Travers, Rolling Stone), “amazing” (Brian Truitt, USA Today) and “the best film of the year” (Christopher Orr, The Atlantic). Arrival was released in Digital HD online on January 31st. Arrival, starring Amy Adams and Jeremy Renner, received eight Academy Award® nominations including Best Picture, Best Director, Best Adapted Screenplay, Best Cinematography, Best Editing, Best Production Design, Best Sound Mixing and Best Sound Editing. In addition, Arrival has been named one of the best films of the year by the American Film Institute, National Board of Review, New York Times, USA Today and many more. Five-time Academy Award® nominee* Amy Adams “delivers one of her best performances” (Brian Truitt, USA Today) as expert translator Louise Banks. When mysterious spacecraft touch down across the globe, an elite team races against time to decipher their intent. As tensions mount between fearful governments, Banks discovers the aliens’ true purpose and, to avert global war, takes a chance that could threaten her life, and quite possibly humanity. Oscar® nominee Jeremy Renner and Academy Award® winner Forest Whitaker co-star in this epic film with “a mind-blowing ending” (Brian Truitt, USA Today) that “you will want to see again and again”(Brian Formo, Collider). 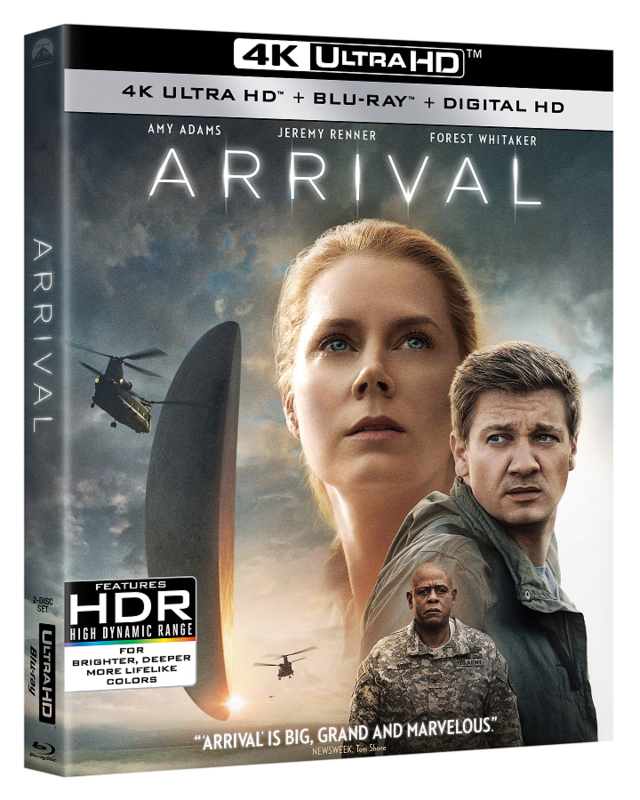 The Arrival 4K Ultra HD and Blu-ray Combo Packs include over an hour of engrossing special features, with in-depth explorations of the film’s subject matter, sound, score, editing and more.